In this issue we provide details of changes to our course management personnel and an update on our Volunteer Program. Appointment of Todd McNamee as Course Superintendent, effective 5th March 2018. Dave Lyons takes over from Brad Lavender as Greens Director, effective 20th February 2018. We are looking for volunteers for course rapid response activities planned for the next few days - see below for details. Todd is leaving his position as Superintendent at Coral Cove Golf Club. When he started work at Coral Cove Golf Club some 19 years ago it was 9 hole course with a further 9 holes under construction so he was involved in the completion of the 18 hole course. With over 30 years green keeping experience Todd has trained 5 apprentices. He enjoys training and sharing his passion for green keeping with them. Todd has a keen eye for detail and presentation of his golf course is his passion. He is an expert in greens management and his playing surfaces are held in high regard. Todd enjoys playing golf and exploring golf courses all over the world. This travel has given him much insight and ideas for continually improving course presentation. He is a member of the Australian Superintendents Association and keeps up to date with new chemicals and practices through their online newsletters. He has experience in administration and an understanding of complete management and budgeting for the purpose of a successful club. Todd is an accomplished Golf Course Superintendent known for striving to achieve to deliver the best playing conditions possible for golfers. Over 30 years of solid green keeping experience and equally effective at relationship building, staff training and team leadership. His hobbies and interests are cricket and is an A grade player, golf, boating and travel. Todd and wife Wendy are looking forward to a lifestyle change and a new challenge. 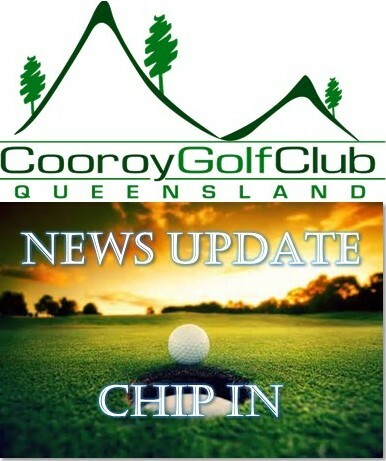 His aim is to take the Cooroy Golf Club forward so that the club meets the expectation of its members and the public. There is positive support for the proposed organised, coordinated Volunteer Program outlined in our recent NEWS UPDATE CHIP IN with enthusiastic offers to volunteer. We are, however, still looking for a Volunteer Coordinator. If you are interested in understanding more about this role speak to Rod Booth - you will enjoy the role. A key part of moving forward with the Volunteer Program will be involving the new Course Superintendent. The current weather conditions present the perfect opportunity to activate the concept of a Rapid Response Team initiated by Dave Lyons. The primary purpose of this team is to quickly and pro-actively take advantage of opportunities that present themselves through advance knowledge of things like weather conditions to make improvements to and carry out maintenance of the course. You can read more about this team by clicking on the button below. NOTE: If you would like to be added to the rapid response volunteer pool email Dave Lyons at daveandtrish8@bigpond.com with a copy to Rod Booth at vets@cooroygolf.com.au. In the meantime we are looking for volunteers to get involved in the following Rapid Response activity. NOTE: Please let Dave know urgently if you are available to assist so he has an idea of numbers. 7:15 for 7:30 start on Tuesday, 27th February. Volunteers assemble at Greens Staff sheds. OBJECTIVE: With soil moisture good from today (21st Feb.), we want to encourage grass grow-over of small bare patches (small only – and surrounded by grass) on landing areas and approaches of holes near club house and adjacent to road, initially. Start on 17th fairway landing area, then over creek to green. Then to approaches of 18th green and down to corner of 1st fairway. The intention was to do this on Friday, but with at least 50 mm of rain today (Wednesday) and another 100 mm forecast on Thursday and Friday, it will not be desirable to have machinery on course. We are targeting Tuesday morning – better weather forecast. MATERIALS: Fertiliser will have been applied to areas beforehand. Topsoil will cover bare patches after aeration of existing soil. If rain predicted from Tuesday, some grass seed to assist. EQUIPMENT REQUIRED: Vehicle with trailer provided and utility will have topsoil. Volunteers bring garden forks for manual aeration, shovels and rakes. If easy to do so a couple of wheel barrows required. Application of fertiliser on Friday 23rd. Although very short notice it will be good to have a couple of people help, again 7:15 for 7:30 start. Meet at clubhouse. Bring raincoat, hat, umbrella’s. Be prepared to get feet wet as adding fertiliser manually to areas proposed (as above). Also hoped to apply fertiliser to tees on 1st, 17th, 16th and 18th. Use club buggies for transport, conditions permitting.